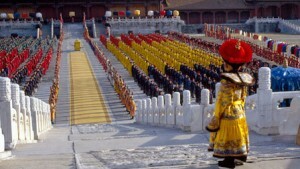 The Last Emperor, directed by Bernardo Bertolucci, places special emphasis on the ways in which costumes determine an individual’s status in society. The color and cut of the costumes donned by each character helps the viewer to understand the personality of each character. However, the one sequence within the movie that deviates from this motif is the first sequence in which the prisoners of war recognize Phu-yi’s face and bow to him as if he is still on his throne. I argue that the costume Phu-yi wears during this sequence distinguishes him from the other POWs, and that ultimately his position as emperor transcends his current identity as a POW within Maoist China. When the viewer first sees Phu-yi in The Last Emperor, he is disembarking a train on the Manchuria-Russia border as a prisoner-of-war. Phu-yi has been brought in for detainment and questioning because he is believed to be a counter-revolutionary. The setting where the sequence takes place is dark and industrial. The sky is cloudy, the ground is damp, and the POWs are being escorted by soldiers. All officers are wearing dark-green uniforms, and the other POWs are dressed in winter gear in dark green, dark grey, or black. Phu-yi stands our from the crowd because he is wearing business formal clothing in the form of a suit-and-tie. 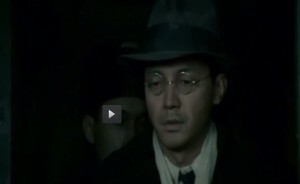 He wears a fedora instead of a fur-lined winter hat, and he is wearing glasses. From this still, the audience can infer that he was an intellectual, or at least worked in white-collar jobs prior to becoming a POW. When he enters the great-hall where the other POWs are waiting, they all turn to stare at him, with wary recognition. Some of the POWs bow towards him even though that is considered disobedience and could lead to death. This is the only time in the film where Phu-yi’s costume did not accurately portray his identity or indicate to people how he should be treated. 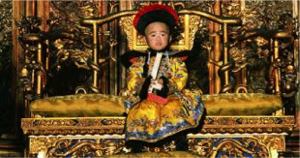 As a young child in the height of his reign, Phu-yi was best remembered as wearing the yellow imperial robes. In the photo below Pu yi has emerged from the Forbidden City to conduct a ceremony. Historically, the color yellow is reserved for royalty, and is only worn by the emperor. Even when Pu yi is forced to evacuate the Forbidden City, he is still recognized as the Emperor in Japan due to his expensive attire. The Last Emperor proves that costumes are not necessarily indicative of how a character inhabits and navigates the setting around them. The Last Emperor tells Pu yi’s story through flashbacks as he is questioned by the communist army. What matters most for Pu yi is not his current status as a POW, which is implied by the suit he wears entering the prison and the mao suit he is forced to wear during questioning. His story shows that people will remember him as emperor because he served as emperor and wore the robes. His cultural relevance in Chinese collective memory will always command respect from people around him regardless of his official title and the clothing he wears. This entry was posted in The Cinematic - Fashion in Film on May 21, 2016 by abomboka. 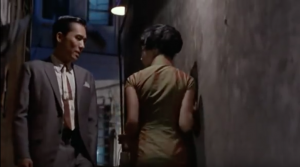 In her piece, “Surface, Fabric, Weave: The Fashioned World of Wong Kar-Wai,” Giuliana Bruno discusses how costume design in “In The Mood For Love” is a deliberately aesthetic choice as a complement to the surrounding set. Fashion, color, and texture act as a subconscious means of creating moods and feelings within the audience. In the above mis en scenes, film producers in “In The Mood For Love” uses two different Qipaos to reflect main character, Maggie’s, emotions to the audience. In the first scene, Maggie somberly retrieves noodles from a noodle bar in a mute-toned qipao in which she runs into her neighbor. Later in the film, Maggie accompanies her neighbor to dinner in a quote differently styled qipao; one of bright colors and patterns. The images exemplify how fashion aesthetics act as an art form to engage space and color in the film to depict the mood of the character within the scene. When viewing the above mis en scenes in “The Mood For Love,” one can compare differences between the two photos through their similarities in an attempt to determine the mood of the scene. Scene 1- In the first mis en scene Maggie wears a qipao of subdued colors that reflect a sense of loneliness and withdrawal. Maggie lethargically meanders into the takeout noodle bar, and though she appears graceful and walks steadfast, the qipao she wears tells the story of pain and a cheating husband. No words are spoken in this scene, however the color of the qipao successfully exudes Maggie’s present mood as one forlornness and dull heartache. Scene 2- In the second scene, Maggie’s qipao is bright, almost neon, and patterned. Though Maggie again ventures to eat noodles, the mood is more energetic than the aforementioned scene. Maggie’s dress reflects a zealousness that was absent in the 1st scene, as new romance makes her more spirited and lively. Scene 1- The male figure, Maggie’s neighbor and love interest, is a key similarity in both scenes. In the first scene, the two are just meeting, and an impeding connection is felt between the pair. They both exude a similar sadness in this scene that foreshadows their attraction. Scene 2- Maggie’s love interest is closer to Maggie in this scene, and his body is now faced toward hers, suggesting an opening up of emotions and deepening of their relationship. Similar to clothing, body language acts as an aesthetic art form that displays unseen thoughts of the characters or rather, their inner feelings. 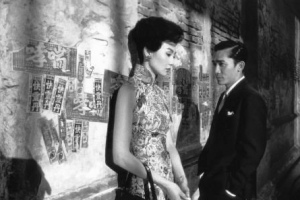 Scene 1- Maggie, in her neutral qipao, becomes “one” with a plain, dark wall, blending into its shadows. This suggests that Maggie has fallen into the shadows and textures of the wall in a mood of somberness. She cowers slightly into the wall, but despite her camouflaging, Maggie still makes a connection with her love interest. Scene 2- Again, Maggie matches the wall behind her, however, this wall is colorful and flashy; a kaleidoscope of more vivid and vibrant emotions. She does not cower against the wall in this scene, but outshines it in its exuberance. This greater suggests how Maggie’s mood has transformed and become brighter as her relationship has flourished. In conclusion, the constants in these scenes (clothing, man, wall) reflect how Maggie’s inner emotions and mood have grown and transformed as her relationship has become more in depth throughout the passage of time. This entry was posted in The Cinematic - Fashion in Film on May 4, 2016 by swallace. In this film sequence, the conflicting colors of the setting, gold and red, mirror the conflict between Flying Snow and Moon over Broken Sword’s love. When the conflict between Flying Snow and Moon is resolved by the death of Moon, so does the conflict in the colors of the setting, as the setting changes to only red. The colors of the setting in this film excerpt, therefore, work to highlight the tension and subsequent resolution in the narrative. The color contrasts that consume the beginning of this film sequence reveal the conflict between Flying Snow and Moon. Flying Snow and Moon’s red dress creates a contrast between the gold leaves in the setting around them. The gold of the setting brings to light, and highlights the betrayal, jealousy, and anger felt by both of these women [shown by their red dresses], as they compete for Broken Sword’s love. Although there seems to be a visual similarity between these two women, as both wear red dresses, their dresses present very different meanings. Flying Snow’s dress is a rich, brilliant red, flowing smoothly in the wind. On the other hand, Moon’s dress is flimsy, faded red. The contrast between their red dresses is representative of Flying Snow’s high social status and Moon’s lower status of servitude. It also shows the contrast between their anger. While Flying Snow’s anger arises from a sense of betrayal, Moon’s arises from a feeling of jealousy. The contrasting nature of the two women is further presented when Flying Snow and Moon are fighting one another [using kung-fu]. Snow fights Moon with ease and grace, while Moon struggles clumsily. During the fight, the golden leaves are blowing in the wind, seemingly attacking Moon for most of the sequence, fighting against and attempting to resolve the existing contrasts and conflicts. The contrast in the color dissolves with the death of Moon. As Moon’s [red] blood drips onto the leafy ground, it morphs everything to red. The red that it turns is brilliant and rich—just like Flying Snow’s dress—exhibiting her valor. Moon’s death, which was signified by the drop of blood from the sword, signified the “death of the conflict.” Both the resolution of the conflict, and resolution of the color, takes place with the death of Moon. The once violent, golden leaves now seem at ease, simply falling from the trees and flowing with the wind. The death of the conflict transformed this red into a sign of victory and love for which Flying Snow successfully fought. In this way, the scenery is a reflection of Flying Snow’s victory, and the death of a great betrayal. In short, Flying Snow and Moon’s fight for love was resolved by Moon’s death, which was reinforced by the scenery’s colors. The original contrast of the red and gold colors of the scenery was resolved at the moment of Moon’s death. In the end, Moon’s jealousy, borne of unrequited love, was overcome by Flying Snow’s true love for Broken Sword. This entry was posted in The Cinematic - Fashion in Film on May 4, 2016 by csgallag. Zhang Yimou’s film Hero tells the story of Nameless, a warrior who attempts, with the help of three assassins, to kill the King. As the story unfolds, the king unravels Nameless’ plot piece by piece in increasing detail. There are three main phases of the film characterized by three different colors. The first phase is characterized by red, it is a story of betrayal specifically between the assassins Flying Snow and Broken Sword that leads to Nameless defeating the assassins, this part of the story happens to be untrue. The second phase, characterized by blue scenes and costumes, tells the story of love and sacrifice between Flying Snow and Broken Sword, however, still presumes that Nameless is attempting to defeat the two assassins to save the King. The final phase of the story is characterized by white and tells the true story of how Flying Snow and Broken Sword sacrifice themselves to give Nameless the opportunity to assassinate the King. The Scene depicted above is part of the blue phase, it shows a fight on the water between Broken Sword and Nameless while Flying Snow lies dead. In this scene the color blue, present in the surroundings and the costumes acts as a narrative bridge between the radical lie that Nameless tells the king and the whole truth of the plot to assassinate the king. The fight takes place on the lake itself, with a dance like quality to the movement over the surface of the lake. 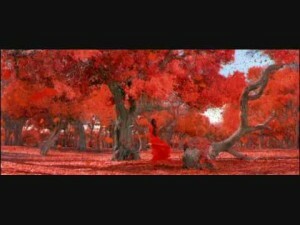 The entire scene takes place in a blue surroundings, which stands in stark contrast to the red forest in the first part of the story and the white surroundings, specifically the desert, in the last scene. If we consider the symbolism of the blue surroundings (the lake) we can consider that it acts as a bridge between the lush forest, often a symbol of life, and the stark desert, often a symbol of death. The blue tones of the scene are carried through the water and symbolize the partial truth of the story that Nameless presents to the king in the blue phase. The blue of Flying Snow and Broken Sword’s costumes further bridges the narrative between the initial lie that Nameless tells and the final truth about the plot to assassinate the king associated with the white costumes. More specifically, Flying Snow and Broken Sword share a similar blue hue while Nameless is portrayed in a black costume. This highlights the notion that at this moment in the plot, the viewer and the king understand that Flying Snow and Broken sword, in their commitment to each other, are willing to sacrifice their lives to fulfill a greater goal. However, the narrative has not yet revealed that Nameless too is part of the plot to assassinate the king. In this scene his black costume, in contrast to the blue background and costumes, portrays Nameless as the outsider or opposing force to Flying Snow and Broken Sword’s plan to assassinate the king. Eventually Nameless adopts a blue costume and begins to reveal his intentions to unify with the three other assassins in order to kill the king. In this way the colors and costumes of this scene serve as a bridge between the fragmentation between characters, specifically Nameless from the three assassins and Broken Sword and Flying Snow from each other and the unification at the end of the narrative not only between the three assassins but of all of China under one king. This entry was posted in The Cinematic - Fashion in Film on May 4, 2016 by sberube. This scene of conflict from the film Hero (2002) between Flying Snow and Moon takes place after Broken Sword and Flying Snow find out that they both betrayed each other. This causes Flying Snow to kill Broken Sword. Moon challenges Flying Snow days later in the forest they are in but she is not as strong as Flying Snow, so she does not succeed in killing her. This story represents one of the different versions of how the “assasinations” of the assasins (Broken Sword and Flying Snow) take place. Analyzing the color of the film like author Robert Burgoyne discusses in “Color in the Epic Film: Alexander and Hero,” (2012) the color red and gold in this scene emphasizes the feelings of betryal & vengaence that only lead Flying Snow to feel dark and empty at the end of the scene and not as powerful as she seemed throughout the combat. After this the gold leaves in the forest turn a deep red which symbolizes the betrayal of Broken Sword which caused Flying Snow to kill both Broken Sword and Moon. The gold color could also symbolize trust and honesty which was broken by Broken Sword and Flying Snow when they betrayed each other. The strong feelings of vengeance and anger that Flying Snow felt toward Broken Sword could be expressed through the deep color red in the scene. The leaves also turn red when Moon falls to the ground, dead, which represents the negative consequences that violence have on the person that uses it to get vengeance. contrast between or transition from gold to red? This entry was posted in The Cinematic - Fashion in Film on May 3, 2016 by mmendoza. Costume design is not simply for appealing aesthetics and creating a nice fashion; it is more than that. Costume design in film is created to be reflective, representative, symbolic and moving. In “In the Mood For Love,” Maggie’s quipaos are representative and also tell a story to further provide interpretation in what is going on in that point that may not be spoken or blatantly laid out for the viewer to understand. It often requires the viewer to look deeper into the purpose of the design of the costume in order to fully comprehend what is going on in the segment. Maggie’s black and white qipao creates contrasting aromas that indulge the viewer to look closer into Maggie and Tony’s relationship, time, and love. First off, the contrasting black and white colors in this qipao indicate a sharp contrast in Maggie’s life. The black on her dress could be representative of the sadness she faces when she is suspicious of her husband’s fidelity. This blackness could also be representative of loneliness and sadness; a dark time period in Maggie’s life. The white, however, could be representative of a new, clean slate in which the story is untold. This white part of her dress could be the potential new relationship which she is developing with Tony, and it is a canvas or blank page waiting to be written on. White also represents innocence, where there is a part of Maggie that feels that, although she believes her husband is being unfaithful to her, she feels guilty developing feelings for Tony. The innocence could also be representative of a simple, innocent crush to mend her lonely, broken heart. The sharp contrast with the blackness indicates a shift in feelings where Maggie feels happy and excited by her neighbor, but there is still an underlying sadness that she feels in her heart. Another important thing to notice is that the black and white lines in the dress do not overlap; they are distinct and separate. These two separate entities could either be representative of Maggie and her husband, Maggie and Tony, or Tony and his wife. However, the divides occur and offer a sense of prediction that the viewer can see that there are distinct things that separate two people, no overlapping is able to occur. It is also important to recognize that certain stripes on the dress are thicker and thinner than others. This could mean that at certain periods in time, one specific entity or person may be more significant in Maggie’s life than the other. This could be representative of her husband, being the dark black stripe in her life, bringing darkness, whereas the white stripe could be representative of Tony, a light in her life. The thickness and thinness indicate that one of the two men play a larger role than the other at distinct times in her life and this is important to note because there is also a sharp contrast between the colors, indicating very contrasting ideals and differences between the two men and how Maggie feels for them both. This entry was posted in The Cinematic - Fashion in Film on May 3, 2016 by mreidy.